Louis Armstrong and his Savoy Ballroom Five: Earl Hines piano; Jimmy Strong clarinet; Fred Robinson, trombone; Mancy Carr, banjo; Zutty Singleton, drums; Armstrong trumpet and vocal. June 28, 1928. Thanks for reminding us on Pops’ 112th Anniversary, Doug. “West End Blues” … an ever modern classic: Ageless, timeless, priceless. A blues marvel in E-flat. That revolutionary introduction made an impact on everyone with ears. Charlie Parker quoted it a minute and a half into “Cheryl” from the Christmas Concert at Carnegie Hall, 1949. On one of the LP’s a DJ’s off-mike voice brutally interrupted Bird’s flights, babbling something about “the new school does borrow from the old.” – He was so wrong ’cause Louis Armstrong was never old school. When I was living in New Orleans in the mid-seventies, I had the chance to hang with many of the musicians who were still alive – who had been there since the early days. A few of them really felt that Louis changed jazz forever because while most of the musicians back then based solos mainly on the melody, he was the first one to really base his improvisation more on the chord changes. I sure hear that when I hear hot five and hot seven recordings. Louis is the man who got me into jazz, I took the album “Ambassador Satch” out of the library in Hempstead on Long Island, put the record on, heard three notes of Armstrong’s trumpet, and immediately realized that I had just heard the music that I wanted to hear for the rest of my life. 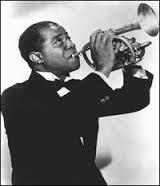 For me, the sound of Satchmo’s trumpet is the greatest sound that God ever created. Louis, Zoot and Monk are my trio of all-time favorites. I might take heat for this, but my intro to Louis was “Hello, Dolly” I loved that record. An older gent who was my friend’s uncle knew a little about jazz and he filled me in about Louis’ importance overall, but I never had the money or the opportunity to buy the records he talked about, one of which was “West End Blues”. I read a lot about him from books I borrowed from the library but never heard his great and historically important recordings till much later. The only Louis I heard was the aforementioned LP and whatever track was played on the radio (All the Time In The World from the James Bond movie) and “What A Wonderful World”. My Dad was NOT a fan of money being spent on music..he still called my stereo setup a ‘gramophone” till the day he died..lol.. When I finally heard the “Hot Fives and Sevens”…it was pure magic. Delayed gratification, I guess. I wish I had better circumstances growing up and unlimited budgets for all things jazz, but …the music was just waiting for me to show up, I guess. If Louis was both a jazz instrumentalist and vocalist of the highest order AND also a pop star in his later life, I think you could do worse than listening to him phrase even on subgrade material. I still cry hearing him sing “All The Time In The World” WE certainly wish that was an accurate statement but we know it’s not true..we have limited time and so much to enjoy..Louis certainly lived life with gusto…and with much love for humanity. There’s a clip from a doc I can’t find at the moment. It was an interview with one of the orchestra members who recorded with Louis for the James Bond soundtrack in England. He mentions how humble Armstrong was and how in awe he was to be in his presence. It was very touching..the gist of it was, “How do you tell a man like Louis what he’s meant to me as a musician and for music in general?” You can’t possibly convey it…words fail you. You won’t take heat here for loving “Hello, Dolly.” Louis made it his own, audiences loved it and, evidently, so did he, witness this 1965 performance in Berlin with his all-stars: Tyree Glenn, trombone; Eddie Shu, clarinet; Billy Kyle, piano; Arvell Shaw, bass; Danny Barcelona, drums. This wonderful performance, so well recorded for German television, and Rob’s experiences growing up, bring many thoughts to mind. First, of course, my own memories of hearing Louis as a teenager from the 5th row in a Field House in my home town in WV c.a. 1957, of later of learning of all his early things that not only defined jazz as we know it, but also influenced almost everyone who came after, and then hearing all of it again in this performance. But what hits me from Rob’s story is the absolutely critical importance of widespread access to jazz in the public media. When I was coming of age in the 50s and 60s in West Virginia, I had access to quality jazz late nights on AM radio from high power, clear channel stations in NYC, Rochester, NY, Chicago, New Orleans, Des Moines, and, because I was a ham radio operator, to Willis Conover on the Voice of America. 60 years later, my only charitable contributions are to support jazz radio, and, with my professional work in pro audio, to support the venues that present live jazz. We all need to do our best to make it possible, even easy, for folks coming up to access the music. Times have changed, of course, and much of that nearly free access is now to an incredible wealth of jazz on youtube, and on dozens of really well programmed jazz internet sites. But there’s still over-the-air jazz in many cities, in the US, virtually all of it on listener-supported public radio. The best of these have jocks that know the music, choose and program it well, and say just enough about the music to let the listener begin to catalog what he or she likes, to learn about styles, and so on. Just returned from the Satchmo Festival in N.O. His birthday seemingly celebrated by the entire city. WWOZ played his music all day long. If you love Louis-and by extention NO trad jazz-this is the festival for you.